The effects of fertilizers on potato chip color were studied over a period of 11 years. Yield and specific gravity data also were taken. Single element and compete fertilizers were used in randomized block and split plot experiments. Most of the work was done with the Russet Burbank variety but in some experiments the Kennebec, White Rose, Norgold Russet and Cascade varieties were also included. Specific gravity and chip color data were taken immediately after harvest. Effects of storage and reconditioning on chip color were recorded in some cases. Though statistically significant effects of N−P−K on chip color were found, the differences were small and of no commercial importance. Neither nutrient balance nor total amount of fertilizer used greatly affected chip color whether the tubers were harvested “immature” in July or in October after the vines were dead. The greatest effect of over-fertilization was on the specific gravity of the tubers. As amount of fertilizer applied increased, specific gravity often decreased which would reduce the amount of processed product per unit of fresh produce. Since most manufacturers of processed potatoes prefer high specific gravity tubers perhaps varieties should be grown specifically for the processing industry. Since proper fertilization did not have a commercially important effect on chip color but greatly increased the yield, farmers should fertilize for maximum production when growing potatoes for potato chips. 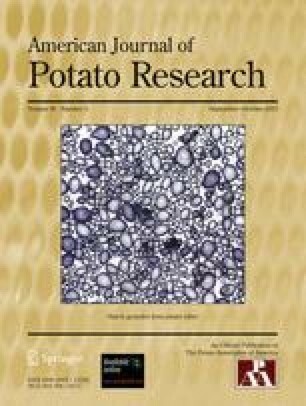 In all experiments conducted to assess the effect of fertilizers on potato chip color, regardless of the nature of the study, potato chip color was found to be almost unaffected by fertilization even when yield and specific gravity were greatly affected. Contrary to the reports of several authors (15, 20, 22, 33, 48), specific gravity was not a good indicator for potato chip color. Such conclusions also would be expected to apply to french fries. Between 1957 and 1969 the average yield of late potatoes has increased from less than 300 to over 400 cwt per acre in the State of Washington. A few growers have produced yields of 700 cwt per acre on sizeable acreages because of increased fertilization. There is no reason why farmers should not fertilize for maximum production of tubers in the Columbia Basin even if color is their primary concern. Scientific Paper 3706, Washington Agricultural Experiment Stations, Pullman, Washington. Work was conducted under Project 1385.